(Photo: Albin Hillert/WCC)Patriarch Ignatius Aphrem II addresses the Global Christian Forum's Third Global gathering in Bogota, Colombia on April 25, 2018. 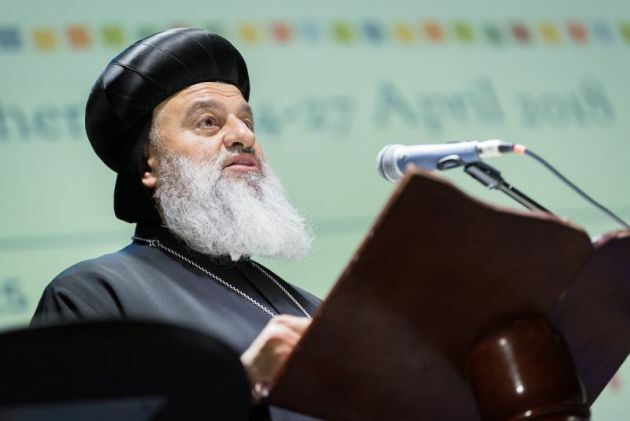 Speaking to 250 world Christian leaders at the third global gathering of the Global Christian Forum, currently meeting in Bogota, Colombia, Patriarch Ignatius Aphrem II said, "the attack carried out by the USA, UK and France has once again set our hope back." He described the bombing as an "unjust act of aggression" that was also "an indication of the low state of affairs our world has reached." On 14 April, the United States, France and the United Kingdom, launched airstrikes against Syrian research, storage and military targets saying they were a punishment after Syria was accused of carrying a chemical attack near Damascus, in which more than 40 people died. It was very clear "that political and economic goals are to be achieved through military means at the expense of the innocent civilian people," said Aphram II. While condemning violence on all sides of the conflict, he said Western powers had a duty to act from a position of principle and, "we expect the international community, especially the 'big guys', to respect the UN Charter and to abide by international law." He reaffirmed an earlier statement by three Patriarchs of churches in Syria, that said the "unjust aggression encourages the terrorist organizations" and "undermines of the work" of the independent inquiry that was about to start into the allegations of a chemical attack in Duma. He said he appreciated the concerns and prayers of millions of Christians throughout the world, and that "we have high expectations from our sisters and brothers in the faith. "We ask you to be our voice in your communities, as the unbalanced media is suffocating our voices. "We need your help in lifting the economic sanctions imposed on us unilaterally. These sanctions have a devastating impact on ordinary people not on governments," he said.